The Soviet T-34/76 tank’s arrival on the 1941 Eastern Front battlefield, defending Moscow and the industrial tank building city of Tula, was a big shock for the German tank crews. This was a well-designed tank that used sloping armour to increase the protection from enemy shells whilst keeping the vehicle’s weight down so that it could be agile at speed driving across country. Its 76mm gun was superior to most of the German panzer tanks guns. 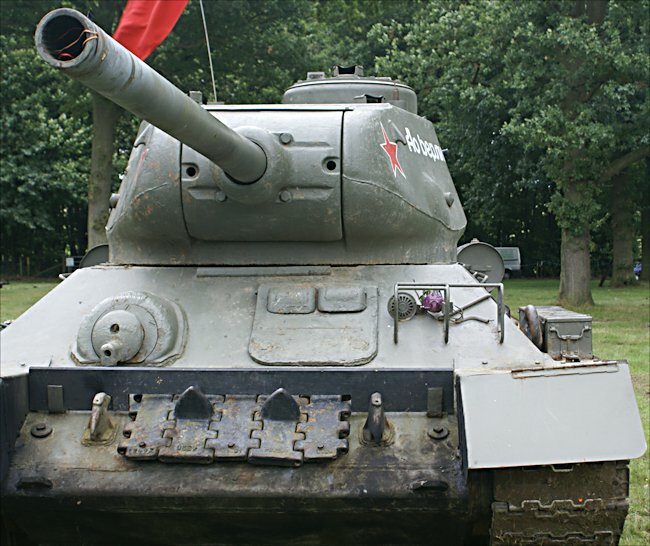 They had to wait until the T34/76 tanks got close before they could fire and cause damage. Most German shells fired at the front of a T-34/76 tank bounced off. They had to flank them to try and hit weak spots in the side and rear. The only advantage the German tank crews had was their gun laying skills from months of training and experience. They normally hit their target first time unlike the inexperience crews in the Russian tanks. 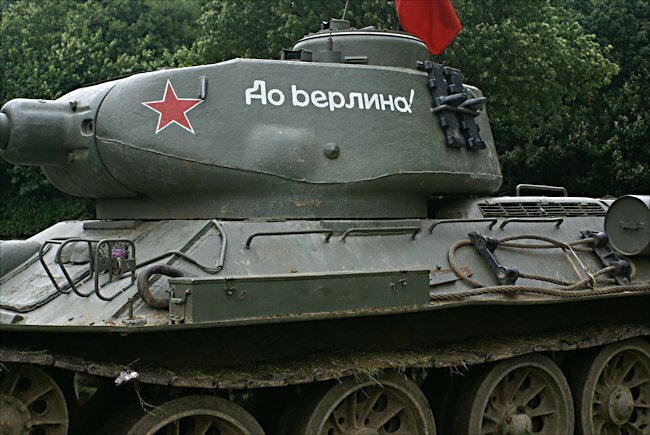 This T-34/85 Red Army Soviet WW2 Medium Tank had three machine-guns that could fire forward: one in the hull and two in the turret. The German designers were so impressed with the Russian tanks that after studying captured examples they incorporated many of the innovative design features in their new tanks. The Panzer V Panther tank and the Jagdpanther are the classic examples on the incorporation of the new knowledge put into action. The width of the tank tracks were increased, like those on the T34/76, for better soft ground cross country mobility. Both vehicles use slopping armour extensively which contrasts sharply with the boxy designs of the Panzer Mark III, IV and Tiger tank. The Russians needed an answer to the German Tiger tank problem. Their first response was to upgrade the gun in their effective T-34/76 tank. They needed to fit a larger cast turret to take the new 85mm gun. It saw action in 1943. 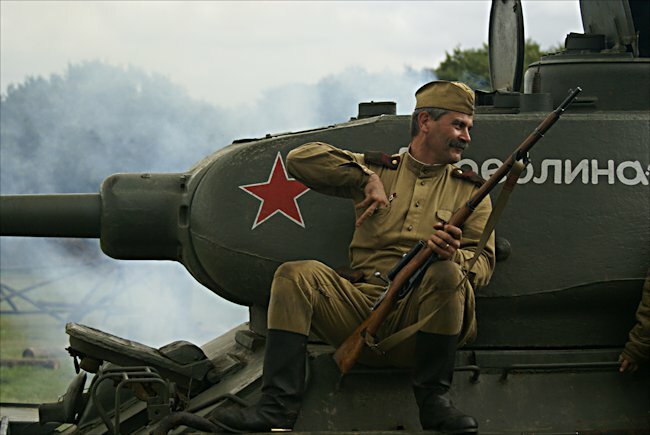 Later that year the more heavily armoured Joseph Stalin IS-1 tank, mounting the same gun appeared on the battlefield, followed by the IS-2 tank with a larger turret that mounted a 122mm tiger tank killing gun. The Russian assault gun range of tanks were also upgraded with bigger cannons being fitted along with more frontal armour. The SU-85 now became the SU-100 and later the ISU-152 rolled onto the Eastern Front. The problem for the Russians was that these new tanks could not be produced as fast as the T-34/85 tanks. During the last two years of World War Two 68% of Soviet tank production was devoted to the production of the T-34/85 tank. Russian tank tactics was to flood and overwhelm the enemy with wave upon wave of massed formations of tanks and assault guns. The Germans lost the later tank battles because they were outnumbered. 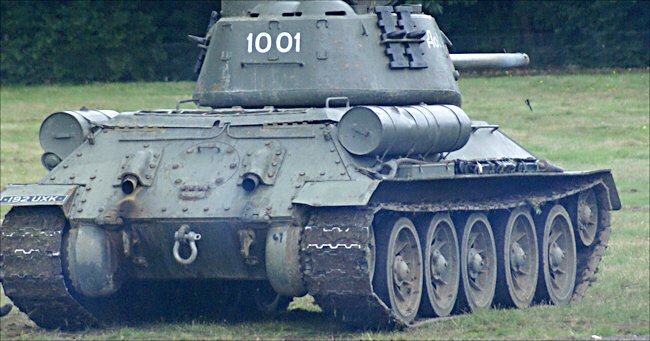 The T-34/85 Tank had three towing loops at the back on the lower hull. It was not just on the ground that new weapons were being tested by the Germans to try and defeat the T-34 tank menace. Before the battle of Kursk, the German Luftwaffe added a new weapon to the wings of the Stuka dive bomber that would terrorise the Russian tank crews. A 37mm flack cannon was fitted to the underside of the aircraft. It was found that this weapon was very accurate and effective at destroying Soviet tanks. To make this weapon work however the pilot had to go into a shallow dive and get within close range of its target. This manoeuvre presented the pilot with a number of dangers. In the middle of 1943 many Russian T34 tanks were knocked out by this new airborne weapon. The sloping armour at the front of the T-34 tank deflected many German tank and anti-tank gun shells but the armour on the top of the turret and over the engine compartment was thin. It could not protect the crews from the high velocity Stuka cannon shells. The armour plating on the rear of the T-34/85 tank is bolted into position. This is to enable the rear plates to be removed when access to the engine is required. The German Panzer Mark III tank started to be withdrawn from the battle field with the arrival of new German tank and tank destroyer designs. The German tank designers were impressed by the design of the Russian T-34 tank. They incorporated some of the design features into the new Panzer Mark V Panther tank. The Panther tanks’ 75mm high velocity gun is better than the Russian T-34/76 tank’s main 76mm gun but when the Soviets up gun the T34 to house an 85mm gun both tanks are on the same level again. The first models of the Panther tank were rushed into production and saw service at the battle for Kursk. Not all the mechanical faults that always become apparent in a newly designed tank had been identified and corrected. The result was a distressingly high rate of mechanical battlefield breakdowns. In time as the tank became modified it became a very competent and feared weapon that outperformed the legendary German Tiger I tank. 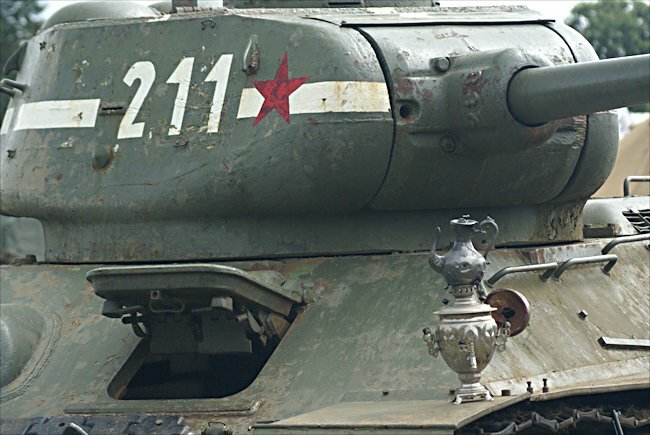 Did you spot the T-34/85 Russian tank crew's tea pot on top of the left track mud guard? German High Command sent 200 new Panther tanks, with all their teething problems, up against Russian T-34/85 tanks at the Battle of Kursk. Sixty of the new Panther tanks broke down on the way to the battle line on the first day of deployment. Most suffered from over heating problems and some caught fire. This was due to a fault in the exhaust system which collected un-burnt fuel and when there was enough it caught fire. This was a very worrying design fault for the crew. A majority of the remaining working Panther tanks were disabled as they drove straight through a Russian anti-tank mine field. There were not many left to engage the Russian T-34/85 tanks. The turret on the T-34/85 was cast not welded. You can see the rough cast joint marks just under the letters. The new German Panther and Tiger tanks could kill Russian tanks at long range but during the Battle of Kursk and during later engagements armoured spearheads collided. The long range superiority of the German guns were negated as most of the fighting took place at close quarters. 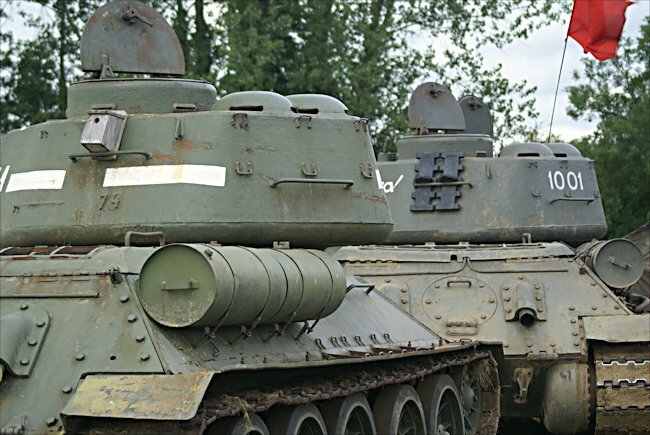 The Russians had more combat vehicles and could over whelm their opponents. In acts of suicide some Russian T-34 tanks rammed German Panther and Tiger tanks causing massive explosions in both machines. 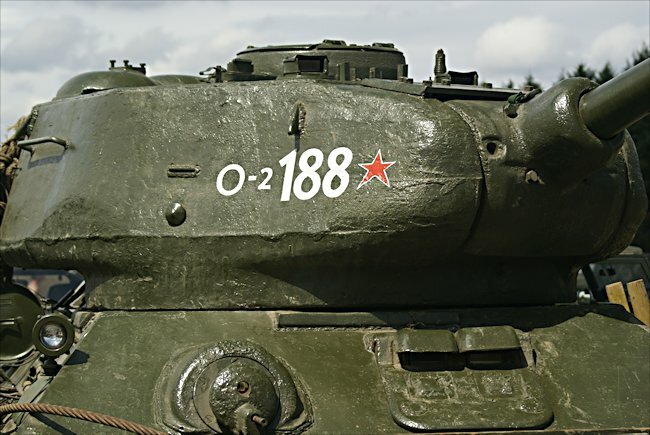 The cylinder on the back of the T-34/85 tank is the extra 90l diesel fuel tank. 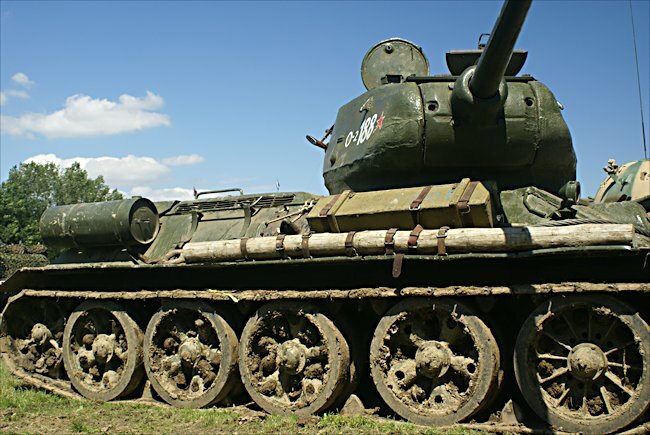 Where can I see more Russian T-34/85 Tanks?